1. Protective Distance - When using an ATM, be aware of others behind you in line. Position yourself at the keypad to prevent someone from observing your personal identification number (PIN). Be attentive to others in front of you using the ATM, stay a courteous distance away. Allow the person to complete their transaction before you approach the machine. 2. Be Ready - Fill out deposit forms and have your card ready when you approach the ATM. When your transaction is complete, pocket your card and cash until you are safely locked in your car or home. 3. 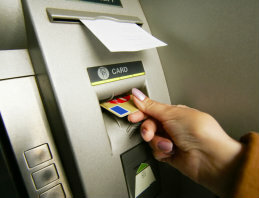 Drive-up ATMs - Keep your car doors locked and the engine running during your transaction. 5. Protect Your PIN(s) - Keep your PIN private. Don't write it down and carry it with you. Memorize it or keep it at home. Position yourself in front of the keypad to prevent someone from observing your PIN. 6. Save Your Receipts - Do not leave your receipt in the ATM machine. Keep it to record the transaction and to reconcile against your monthly statement. 7. Be Aware - Stay alert to your surroundings, especially at night. Park in well lighted areas and have someone accompany you. If you ever notice anything suspicious, leave immediately and use another ATM location or come back later. 8. Report Suspicious Activity - If you notice anything unusual, cancel your transaction, pocket your card, and leave immediately. Go to a safe place and call the police if you suspect dangerous or illegal activity. 9. Lender's Regret - Never lend your ATM cards out. Your ATM card is your responsibility. Be sure you keep track of where all your cards are located. 10. Report Lost or Stolen Cards Immediately - Call the bank as soon as you realize your card is lost or stolen. If you witness a crime, report it to the police and to the operator of the ATM machine.